Have you ever noticed that the most beautiful things in nature are impermanent? Rainbows, sunsets, blooming flowers, even old stately trees will someday fall. I think this is one of the most important reasons for little ones to be exposed to nature, to be able to explore it, notice it, and see how imperfectly perfect and beautifully impermanent it is. A lovely, focused way to see this impermanence is to work with your little one to create a nature mandala. All you need is what you find – no special tools for this centering creative activity. But first, what is a mandala? Loosely translated from Sanskrit, mandala means circle and represents wholeness. Mandalas are geometric shapes that can be seen all throughout nature out to the cosmos if you look – from the spirals of snail’s shell to our ever-spinning universe. Because mandalas are so encompassing, they are the perfect tool to explore art, science, and so much more. Find a location you love. Working on a mandala takes time and can be a very quiet and reflective activity, even for little ones, so have your child find a spot that they deem to be “perfect.” We chose to build our nature mandala at the beach – waves coming in, tides rising and falling, the moving of sand (and any castles in their way! ), the ever-changing landscape from day to day and year to year. The beach can be a very obviously impermanent place where little ones are able to witness how nature reclaims itself through wind and waves. Gather your materials. Before beginning to create your mandala, you need to gather your supplies. Go on a bit of a nature walk and look for anything to add to your pattern. If it’s laying on the ground, it’s usually OK to pick up. Try not to pick too many things (like leaves or grasses) to add – instead try to find things that have already fallen. Start from the center and work your way out. There is no right way to make a mandala, but because it generally is a circle moving outward, it’s easiest to start in the middle. Lay down your basic framework, then go back to fill in the details. We started by drawing a circle in the sand, then laying down the stones and sticks. Add your personal touch. What can you add to the mandala that is uniquely you? Our little one found little geranium flower buds that had been snapped off along with the dead bloomed flowers. Carefully she picked the little buds, peeled away the dead outer petals, and placed the bright closed bud into the center of our mandala. What special touch will you add? Let nature take its course. 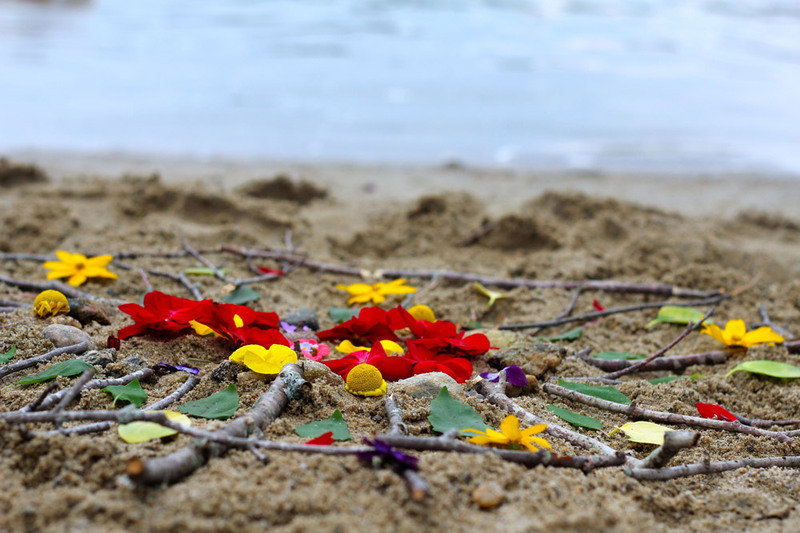 Like sandcastles at the beach, nature mandalas are temporary pieces of art. There are many ways your nature bits could be returned back to nature – waves may come, a storm may blow, birds may chose sticks and grasses for their nest, an animal (or person) may walk right through it – you just never know. When you’re done with your mandala, reflect on how beautiful it is, how it made you feel, how it may make others feel when they see it. When we were done with our mandala, not 10 minutes later a curious little puppy came along sniffed his way around, in, on and through our mandala, which was then no more than a colorful pile on the sand. But no matter how long your mandala lasts for, the way you felt while making it is what’s important. Where else could you make a nature mandala? Could you make one in your home? What would you use? Where would you put it? Mandalas are pieces of impermanent art. Can you think of a way for you to remember what your mandala looked like? What tools will you use to record it? Martin & Sylvia got a bit upset at first when they saw other people working on their sandcastle – how would you feel if someone else worked on your mandala? If you found a nature mandala, would you change it or add to it? How come?